Located in Shilin district, Shilin is the largest night market in Taipei with easy and convenient transport net network. It is not only the favorite night market for the locals, but also a "must go" night market for overseas visitors when they have a trip in Taipei. The Shilin Night Market cover some extensive areas, from the public Shilin markets temporary shed across the Jiantan MRT station. After sunset all shops and stalls start their business and crowds start to emerge into the market until midnight. Wide varieties of gourmet snacks provided here are what it is famous for. Some special delicacies that would definitely make you want to come back for more are Sausage Wrapped in Glutinous Rice, Oyster Omelet, Shilin Super Size Huge Chicken Cutlet and Bubble Tea, etc. These varieties of snacks are the main reasons for attracting loads of crowds. 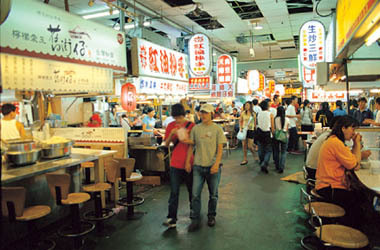 Shilin Night Market covers the areas around Dadong Rd., Danan Rd., Wenlin Rd.,Jihe Rd.in Shilin District. Gourmet Snacks, Clothing, General Merchandises, and so on.